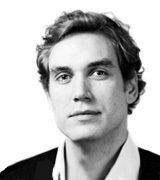 Freddie is Editor-in-Chief of YouGov. He was previously founder of Opigram (now YouGov's online opinion sharing platform) and PoliticsHome.com, the Westminster news service. på april 29, 2015, 4:18 p.m.
Britain is in the midst of one of its longest and closest fought election campaigns in decades. Traditionally British election campaigns last a matter of weeks, but since at least the end of 2014 British politicians have been battling one another to secure victory when the country goes to the polls on May 7th. Under the British system voters do not elect the prime minister directly, but rather vote for a local representative, a Member of Parliament (MP). Traditionally, the party which controls the majority of seats in the House of Commons will then form a government, with the leader of that party becoming prime minister. In 2010, however, no party won an overall majority, though the right-wing Conservative Party did win the most seats and in the end have run Britain together with the centrist Liberal Democrats in a coalition government. 2015 is also set to result in no one party winning a majority, as smaller parties have only grown in popularity since 2010. The UK Independence Party (UKIP), which opposes British membership in the European Union has grown significantly in popularity, along with the environmentalist Green Party and the Scottish National Party, which supports independence for Scotland. The Liberal Democrats, however, are on track to lose a significant number of their seats in the House of Commons. The YouGov Nowcast is a statistical model that looks at the detail of voting patterns on a seat by seat basis to work out how the national vote share translates into seats. It includes more data from more respondents than any other election forecast. We share some data with some academic forecasting groups, such as Chris Hanretty’s electionforecast.co.uk (recently borrowed by US forecaster Nate Silver), but only the YouGov Nowcast has the full volume of constituency-level voting intention responses that we believe are the best indicator of voting behaviour. It is also important to point out that, unlike other forecasting models, the YouGov Nowcast includes no speculation or educated guesswork about things that haven’t happened yet, such as late swings back to incumbents. It is a pure reflection of the state of the campaign today. The latest Nowcast makes use of constituency level voting intention data from 181,806 UK voters, including 40,876 new interviews since the last published version on April 23rd. Since last week, the Conservatives have gained four seats and lost two, bringing their total to 272 (+2), while Labour has lost three and gained two for a total of 276 (-1). The SNP continue to cement their position in Scotland, rising to 52 seats out of 59, potentially giving them more than twice as many MPs as the Liberal Democrats, who slip back to 24. So far, this is more movement about the edges than a trend. The Conservatives’ internal ambition is to retain 300 seats, and that the Lib Dems retain over 25, allowing the current coalition to continue into a second parliament. At this point, with eight days to go until polling day, something dramatic will need to happen to achieve that ambition. 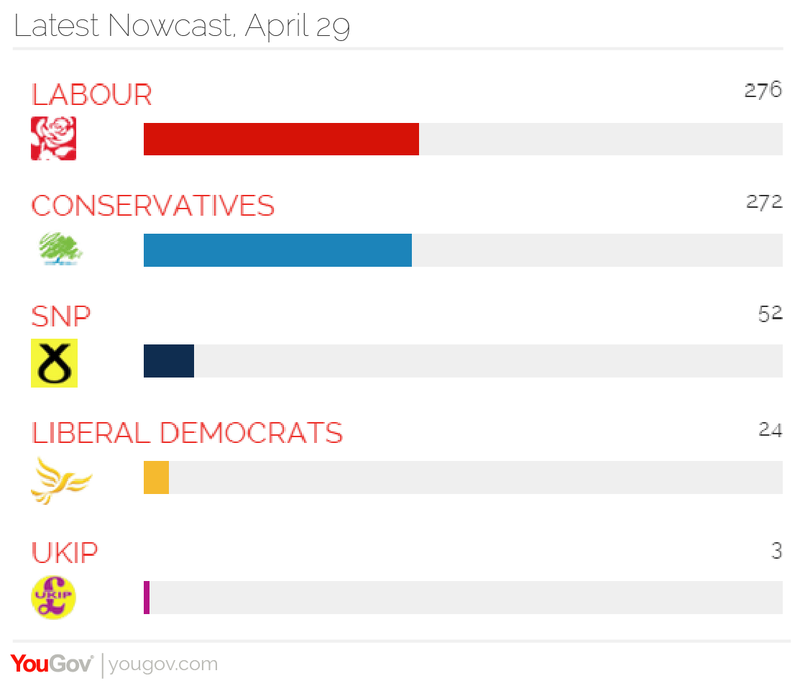 On today’s Nowcast numbers, a Labour/SNP block would command a majority in the House of Commons (328), while the Conservatives and Liberal Democrats would fall well short (296) even with support from DUP and/or UKIP. Whether or not the Conservatives edge ahead of Labour in seats, the overall arithmetic is plain. David Cameron's hopes of remaining prime minister need to be pinned on a perfect recipe of a strong incumbency factor, a unexpectedly prevalent 'shy Tory' factor and a significant late campaign swing. On today's data, in the race to Number 10, Ed Miliband is in the stronger position.